Portuguese is the official language as well as the most widely spoken language in Brazil. Portuguese is the official language of Brazil, as well as its most used. Portuguese is the official language as well as the most widely spoken language in Brazil. With roughly 204 million speakers, Brazil is the world's most populated Portuguese-speaking country by a wide margin, followed only by Angola and Mozambique, which boast 20 million and 14 million speakers respectively. Brazil is the largest country in South America both by land area and by population. It is home to over 209 million people, and its largest city is São Paulo, which also happens to be the largest city in South America as well as one of the largest cities in the entire world. Brazil is known for being a megadiverse country with an impressive wealth of plant and animal species. It is home to the world-famous Amazon Rainforest and Amazon River. The country is an up-and-coming tourist destination, mostly thanks to its impressive beaches, national parks, and UNESCO World Heritage Sites. Portuguese is by far the biggest major language spoken in Brazil, with around 97.9% of the population using it as their primary language. Brazil is unique for being the only predominantly-Portuguese speaking country in South America. 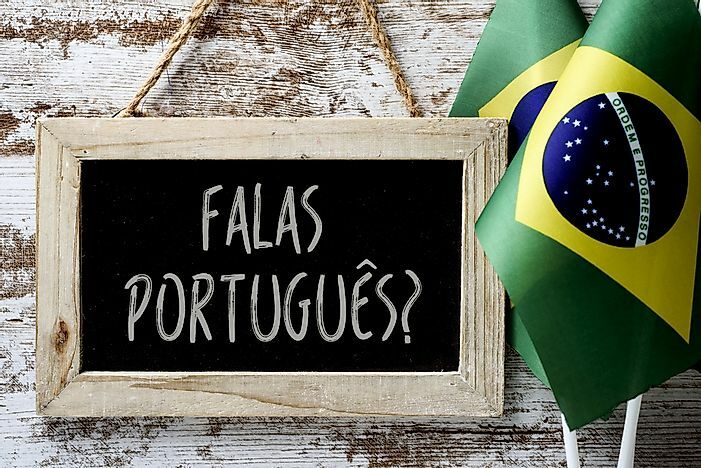 Though Brazilian Portuguese and the Portuguese spoken in Portugal are mutually intelligible, there are some colloquial differences between the two. Prior to colonization, a number of indigenous languages were spoken in what is today Brazil. However, after the Portuguese arrived in 1500, Portuguese began to emerge as the primary language. It is a trend that has continued to this day. Though the speakers only represent around 1.9% of the population, German is the second-most reported language in Brazil. The number of German speakers was particularly strong in the 1940s, when many immigrants from Germany arrived in the country. However, German remains a commonly-spoken language to date, as many German immigrants have preserved the use of their language over time. A German-language newspaper by the name of Brasil-Post has been in print in São Paulo for fifty years. German is taught in schools in some municipalities in the country. As aforementioned, the indigenous languages of Brazil predate European colonization. Many of these languages have preserved over the years and continue to be in use to this day, including Ticuna, Kaingang, and Kaiwá Guarani. Due to the country’s geographic proximity to Spanish-speaking countries as well as similarities between the two languages, many Brazilians can understand Spanish. This is especially true in areas of the country that are close to its Spanish-speaking neighbors. However, Spanish fluency is not widespread throughout the country as interest in Spanish as a second language is often overtaken by English. English is often taught as a second language in schools in Brazil, and many Brazilians also partake in private English classes. Like most countries, English proficiency is most common inside the country’s major cities. It is estimated that out of the estimated 5% of Brazilians who speak an additional language, 3% speak English. Like those who immigrated from Germany, there was also a large Italian emigration to Brazil in the 20th century. As a result, the Italian language also has a presence in the country. However, the language has not been conserved as well as the German language.